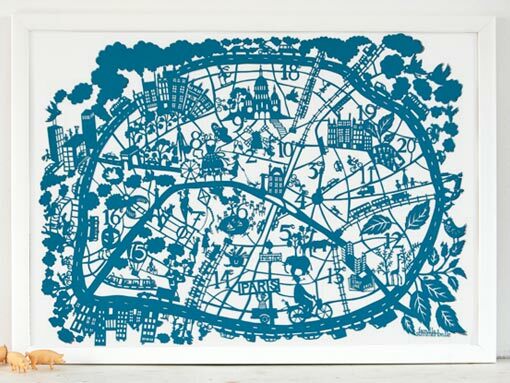 Loving this gorgeous, cerulean blue print of a handcut map of Paris from UK-based shop Famille Summerbelle. Now this is the kind of thing I want hung on my walls--it's truly the perfect Parisian souvenir for grownups. I could gaze at all the little details all day long. Here's another handcut map of Paris--it's more expensive than the one shown here, but it's an original, handcut piece. It must've taken nothing short of serious patience to create such a work of art. I'm so happy to have descovered your blog! I love this print! That is the coolest thing I have seen all week. Tirelessly tired of the tread warn thin juxtoposition heart mind and metaphor but loveless is my nature and my nature is a whore. Cool print. Going to check out their shop now. Great looking blog and congrats on being a "Blog of Note"!!! Now I'm off to get a handcut map of Essex...if anyone makes one. What a gorgeous piece! I'm amazed by the detail they've been able to cut - truly an art. Would love to have this hung up at home. These are absolutely gorgeous!! Thanks for sharing- I can't wait to buy one of these. Very soothing for your eyes indeed. This totally slays me. Beautiful work! I love this print, but I was wondering if you had any suggestions for a place to buy really pretty maps of Paris or even all of France in general? I'd love to give my husband something like this for his birthday and order it from the States if possible. Rebecca, try Banana Streudal on Etsy. I just purchased a great work on paper from them. Congrats on making Blogs of Note!! Your blog is beautiful. I am of the tendency that if it's pretty, but not practical, there's no point. Therefore, I am grateful to see the two combined!! Ah! I LOVE that print. Great stuff. This is really a lovely blog.Its my goodness that found your blog.You made really valuable discussion.